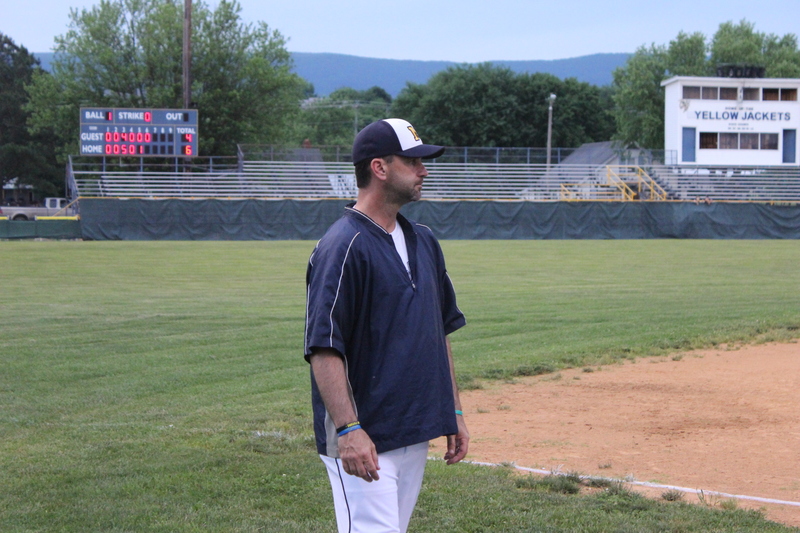 Class A Moorefield Baseball skipper Wade Armentrout earned his 350th career victory as the Yellow Jackets rallied from a 4-nil deficit to defeat Class AA Frankfort 6-5 in a state tournament tune-up game at George Hott Field on Memorial Day. “That’s a credit to the players. 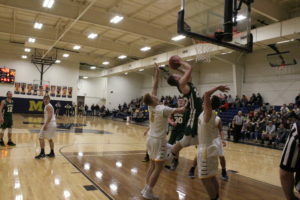 It takes a lot of effort on their part and support from parents and assistant coaches, those are the guys that make all that happen,” Moorefield Coach Wade Armentrout remarked. This is the third milestone victory coming against the Falcons during Coach Armentrout’s career: 200, 300 and 350. 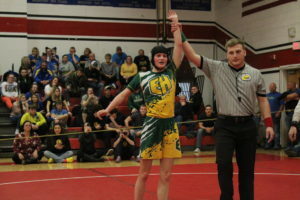 There was no celebration shower for this milestone victory and Coach Armentrout was fine with that not happening again before the state tournament. Coach Armentrout improved his career record to 350-176 in his 19th season at the helm, but remains focused in the hopes of adding two more wins in Charleston this weekend. No. 4 Class A Moorefield and No. 4 Class AA Frankfort needed a game to prepare for the state baseball tournament in Charleston, so the teams joined forces to work on their pitching, batting and defense. “It means a lot for us to keep playing. You don’t want a big layoff this time of year. You want to see live pitching and have real game situations,” Coach Armentrout commented. 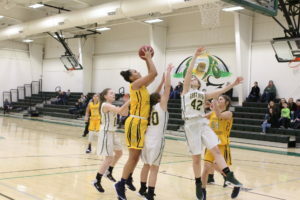 The Yellow Jackets (21-9) will face top-seed Charleston Catholic (25-11) in the first round of the Class A state tournament on Friday at 5:00 p.m. and the Falcons (23-6) will meet Wayne (25-4) in the Class AA session on Friday around 12:45 p.m.
Moorefield pitcher Blake Watts had his fourth pitch hit by Frankfort leadoff batter Zack Whitacre sending a line drive to shortstop Isaac Van Meter for the catch. The Falcons got a baserunner as Caleb Hare took a full-count pitch into the left field gap for a single, then a fly ball by Foster Conis was called and caught by Moorefield centerfielder Jake Ours and Watts struck out Blake Wasson after a stolen base to end the side. Frankfort starting pitcher and Kent State University-commit Blake Wasson had his second pitch taken by Moorefield leadoff batter Brent Moran into right field where the ball was caught by Brendan Whiteman. Wasson issued a walk to Moorefield’s Grant Keller before notching a full-count strikeout on Blake Watts. Jake Ours singled into center field and Hayden Baldwin drew a free pass to load the bases for the Yellow Jackets, but Wasson fielded a grounder by Isaac Van Meter to deny a run. In the top of the second inning, Frankfort’s Wyatt Yates grounded out to Watts on the mound with the throw to first baseman Matt Mongold. Whiteman rocketed a shot which appeared to be going into left field, but Moorefield shortstop Isaac Van Meter stopped its momentum at the edge of the grass causing it to ricochet to side by a yard giving Whiteman enough time to reach base. An attempted pickoff went awry as the ball slipped by Mongold and Whiteman advanced to second base. Frankfort’s Blake Rhodes hit into a groundout collected by Van Meter to Mongold for this second out. Nick Corwell zipped the ball past the reach of Mongold, but Moorefield second baseman Brent Moran made a diving save and threw from his knees to Watts covering first base as the Falcons stranded one. Moorefield’s Lane Ours grounded out to Frankfort shortstop Zack Whitacre, then Garett Haggerty hit a line drive out to first baseman Blake Rhodes before Mongold drew a walk and was stranded on a groundout by Moran to Rhodes. A majority of the scoring for the game was in the third inning as Frankfort went up 4-0, then the Yellow Jackets answered with five runs for the lead.